Anthony sits with his twin sons in his home at Richmond Place, Impact NW’s transitional housing apartments. Anthony was looking for a chance. After experiencing domestic violence, splitting with his wife and seeing his children taken into foster care, Anthony found himself searching for the stable housing that would reunite his family. But he hit barrier after barrier. One of Anthony’s twin boys. That’s when Anthony found Impact NW and the chance he had been seeking. “Impact NW was the first place that opened its doors to me as a single parent,” explained Anthony. Through Impact NW, Anthony found housing at Richmond Place, a 20-unit apartment building in SE Portland for families to recover from homelessness and build a future. For Anthony, Richmond Place was more than a place to live—it was a way to get his 3-year-old twin sons back from foster care. The stakes were high. Anthony had left a situation of domestic abuse, and then his ex-wife, who experiences mental health challenges, turned their sons over to Foster Care. They were there for six months before Anthony found Impact NW. Anthony recently left Richmond Place and has his own place a few blocks away. 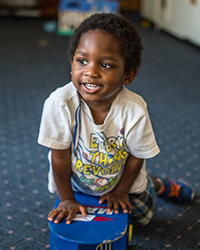 The boys are thriving at their preschool, and Anthony is training to be a social worker. of substance abuse, mental illness, or have experienced domestic violence. We provide shelter for up to 2 ½ years, working with families to create personalized recovery plans.